Download Branded And Official Windows 7 Themes ! In order to make the Windows 7 launch greater, Microsoft has begun to roll out the goodies and themes of Windows 7. Although we have already seen a theme of Windows 7, yet we have a few more official “Branded” Windows 7 themes. If you want to have a theme of Coke or Pepsi, you are welcome. 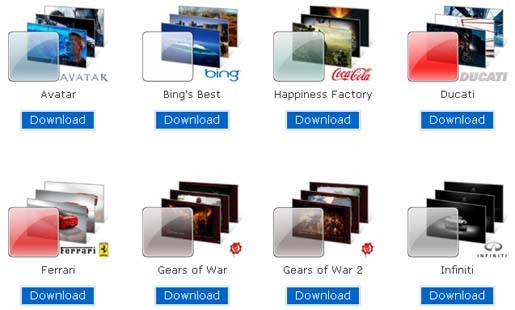 The biggest brands can get their own official Windows 7 themes comprising Bing, Coca Cola, Ducati, Ferrari, Gears of War, Infiniti, Lugares, Coloridos, Pepsi, Porsche and Zue. Each of the themes has a visual interface resembling brand in focus with exclusive background images.